USSR was the largest nation in the world, and so it is no surprise that records were produced in a range of locations across the country. Although the records were generally the same, each pressing plant would use its own labels and design its own record sleeves, so a given LP or EP will exist in multiple editions. The location where the record was manufactured is given on the label, above the play hole (see image, right). A guide to identifying each one is given below. The Georgian plant was situated in Tbilisi, which was an important industrial centre in the Soviet Union. Latvia came under control of the Soviet Union after World War II, and its largest city, Riga, was where local records were manufactured. The inscription above appears on records pressed in Russia's plant at Leningrad (now called Saint Petersburg). Uzbekistan's pressing plant was located in the city of Tashkent. It is easy to tell whether a given record is stereo or mono. All Soviet records, including flexi-discs, carried a symbol next to the play speed inscription - an inverted triangle for mono, and two overlapping circles for stereo. The next number indicates the style of the recording. All pop music, including all Top of the Pops-type releases are catagorised with a 6. Thus, the prefix C60 indicates a 12-inch stereo vinyl LP of popular music. Then comes the main catalogue number. Note that odd numbers were used on A-sides, the next even number appearing on the B-side. Thus, the A-side may have C60-05007 but if we turned the LP over we would see C60-05008. Because of this system, USSR records are catalogued overall with both, using the format, C60-05007-08. Returning to our example number C60-05007-08, we check the sequence for stereo vinyl and find that the number 05007 (and of course 05008) dates to 1974. The system above tells you when a record was first issued. But subsequent issues of the same disc will retain the catalogue number, regardless of when they are physically made. 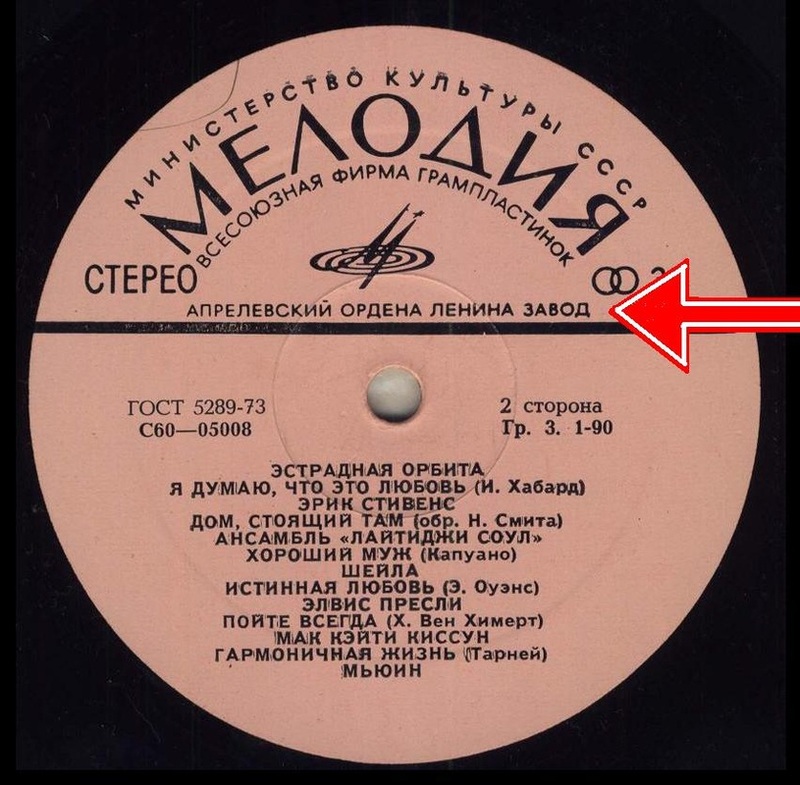 The picture here shows a detail from a Soviet record label, and above the catalogue number is another inscription: ГOCT 5289-73. This gives a very approximate guide to when this particular disc rolled out of the pressing plant. In English, this is called the GOST number. It refers to the manufacturing standard in use in the Soviet Union at any given time, and the last two digits ("73") represent the year that the standard was introduced. Relevant standards were introduced in 1968, 1973 and 1980. Practically all Top of the Pops-related Soviet records carry the 1973 GOST mark, but we know of at least one which was issued in 1974 (according to the catalogue number) but carried the 1968 standard, so the numbers should not be taken as absolute. However we also know of one marked with the 1980 standard, and so we can be confident that this was pressed after 1980.